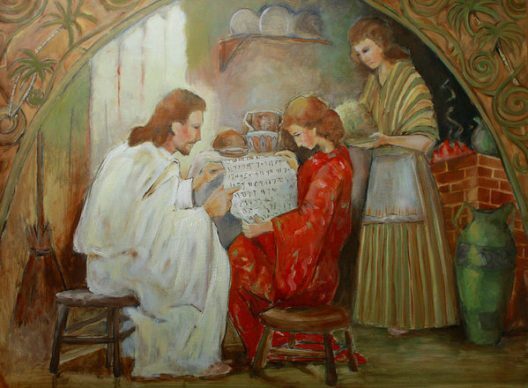 Gospel Doctrine New Testament Lesson #1; Isaiah 61:1–3; Joseph Smith Translation, Luke 3:4–11, John 1:1–14; 20:31. The Gospel of John begins with a reminder of the strangeness of its story. The hellenized world in which it was written already had frightening tales of gods who ventured down from Mount Olympus and into the mortal world. Their encounters were sometimes benevolent but more often dangerously capricious: Helpless humans ended up lured across the sea by lustful Zeus disguised as a bull, transformed into hunter’s quarry by vengeful Artemis, goaded into war by raging Ares, and on and on. The New Testament continues this ancient theme of gods among mortals, but its story is a stark reversal. It describes a god whose life on earth was sorrowful, downtrodden, one who experienced pain and fatigue, was humbly self-sacrificing, and was executed in disgrace. This is our Christian story. It is our light of the world and good news for all. As John tells us in splendid poetry, the Word, the Creator and Law-giver of the world, became part of creation, subject to the laws of nature and His own creatures. He came, not in a brief foray of adventure, but to become Immanuel, the god who is with us and like us, and ultimately redeems us. What kind of rescue is this? We aren’t saved by a deus ex machina, a god in a blaze of glory who swoops down to take us away from our troubles. The gospel that we learn has sorrow woven into its fabric. We can’t overcome the evils of the world through shallow or forgetful cheeriness. Instead, our Savior carries the wounds of our transgressions and of his earthly experience with him. He weeps with us. He teaches us how to mourn with those that mourn, how to turn our hearts to generations before and after us. His love is what saves us, and that salvation is shown in our own ties to each other, our empathy for one another. The Gospel of John isn’t the first book in the New Testament, but it seems fitting to start a year of study with John 1:14, the prologue to his narrative of Christ’s life. This text is literally ancient history, and one danger in studying the New Testament gospels is that astonishing story of Jesus’s presence on earth will come across as someone else’s story, not ours– that we will read it as something that already happened, a perfectly completed past event, not existing in our present lives. But John insists that Christ is not an abstract idea. He became flesh. He became real. And so, my challenge for myself is to turn the study of scripture into something real — to make the Word flesh in my own life. This is really hard! It’s so much easier to deal with abstract concepts on a page or on my phone than to deal with real life. It’s lovely to read about ideals of truth and kindness, but reality means slogging through tedium, confusion, and fatigue. It means dealing with bad weather, bad traffic, and bad tempers. It means being distracted and messing up a lot. It means being sadly reminded that we are removed from Christ, at least his physical presence. Yet John’s opening verses remind us in all this confusion, Christ can still be present. He is not separate from us in the absolute sense but is always ready to be with us. And by reading scripture, we can receive his Spirit and make Him come alive in our own lives. We can live deeply and be present in His love. When the Gospel of John declares the miracle of the Word made flesh, he introduces readers to his own firsthand witness, telling the story of Christ among men and describing himself as the disciple whom Jesus loved (John 19:26). This may seem an odd self-identifier, perhaps a little boastful. But John’s narrative is overflowing with love, and his authority as narrator comes from this special witness of His love. In writing to us, John broadens his particular experience of being loved by Jesus into a declaration of God’s love for the entire world (John 3:16) and of the love engendered by Christian discipleship (John 13:34-35), (John 14:15). Let’s do our part to find this miracle for ourselves, to turn that universal declaration back into particular personal experiences and find Christ’s love in our own lives.